Click image to enlarge McNary Dam. 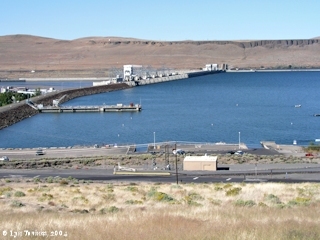 McNary Dam spanning the Columbia River from just upstream Umatilla, Oregon, to upstream Plymouth, Washington. Image taken from Dam overlook, Oregon, off of Highway-730. Sillusi Butte is the high point visible on the Washington State side of the dam. Image taken September 24, 2004. 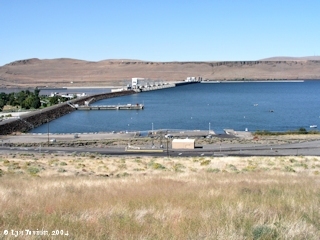 The McNary Dam is located at Columbia River Mile (RM) 292.5, at the head of Lake Umatilla, the reservoir created by the John Day Dam. McNary Dam spans the Columbia River from Umatilla, Oregon, to Plymouth, Washington, at a location once known as the "Umatilla Rapids". Lewis and Clark refered to these rapids as the "Muscle Shell Rapids". 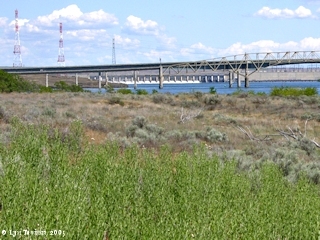 Immediately downstream of McNary Dam is McNary Wildlife Nature Area and the Interstate 82/395 Bridge. Sillusi Butte is on the Washington side below the dam and was noticed by Captain Clark. Upstream from McNary Dam can be found McNary Beach, Warehouse Beach, and Sand Station, all managed by the U.S. Army Corps of Engineers. 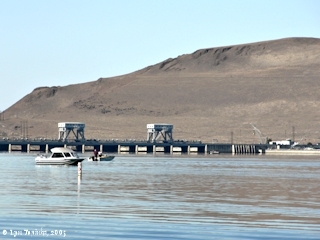 Hat Rock and Boat Rock are also located upstream of McNary Dam on the Oregon side. 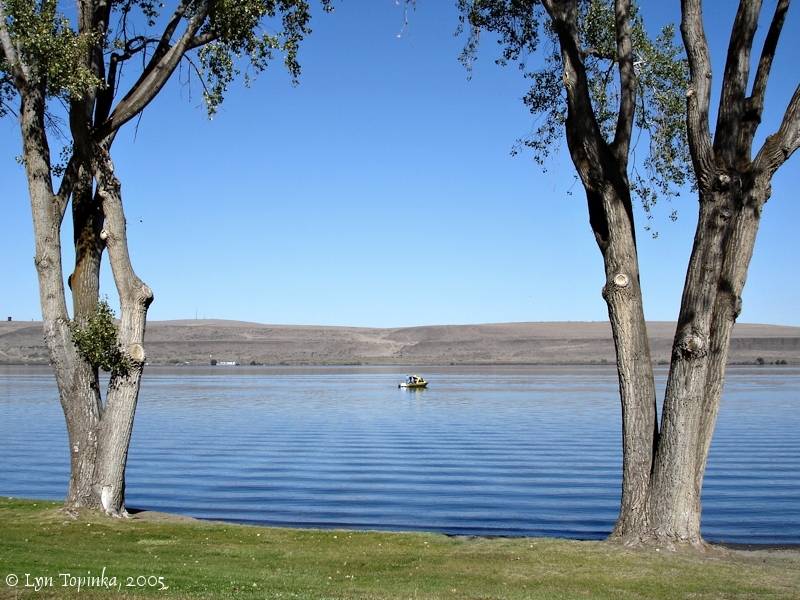 Lake Wallula, the reservoir behind McNary Dam, extends 64 miles upstream and reaches as far as the mouth of the Yakima River. Lewis and Clark first passed through this area on October 19, 1805, and again on their return in April, 1806, where they camped downstream of McNary Dam near Plymouth, Washington. In 1945, Congress authorized construction of a dam at the Umatilla Rapids, naming it after the late U.S. Senator, Charles McNary. It awarded the first contract for construction in April, 1947. By 1950, part of the lock, fishway and spillway rose above ground on the Washington shore. A year later barges headed upriver. Construction was completed in 1954, with all power units in operation by February 1957. 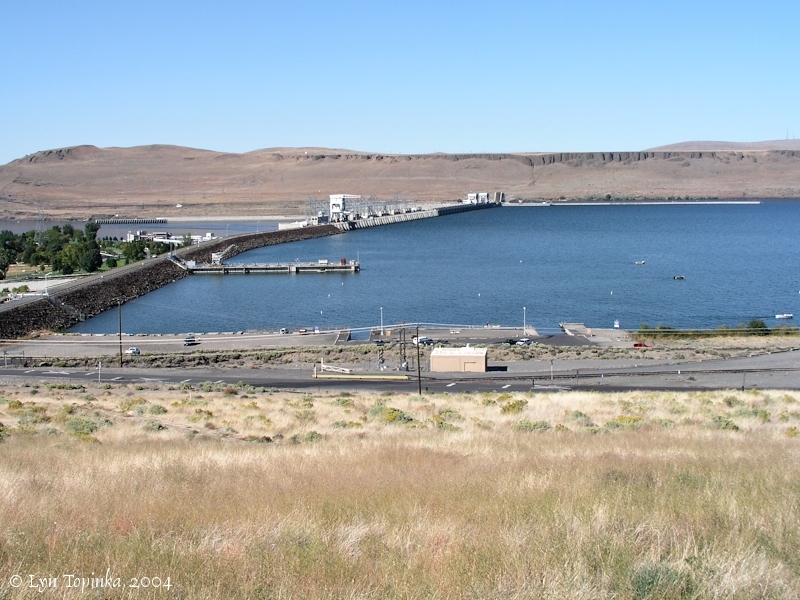 McNary Dam is 7,365 feet long, and rises approximately 183 feet above the streambed. 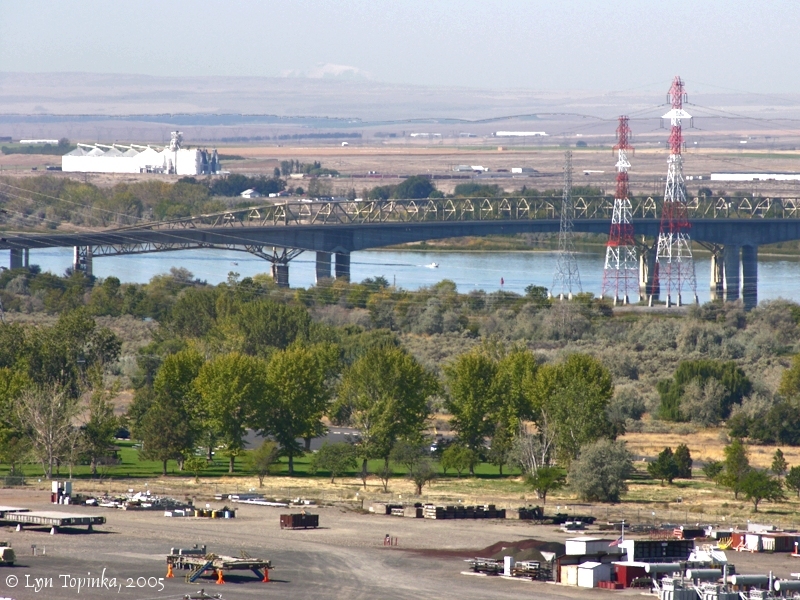 It consists of a concrete structure with an earthfill embankment at the Oregon (south) abutment. The spillway is a concrete, gravity-type spillway dam, 1,310 feet long, and contains twenty-two 50x51 feet vertical lift gates. The dam's crest is at elevation 291 mean sea level, which is designed to pass a design flood of 2,200,000 cubic feet per second. 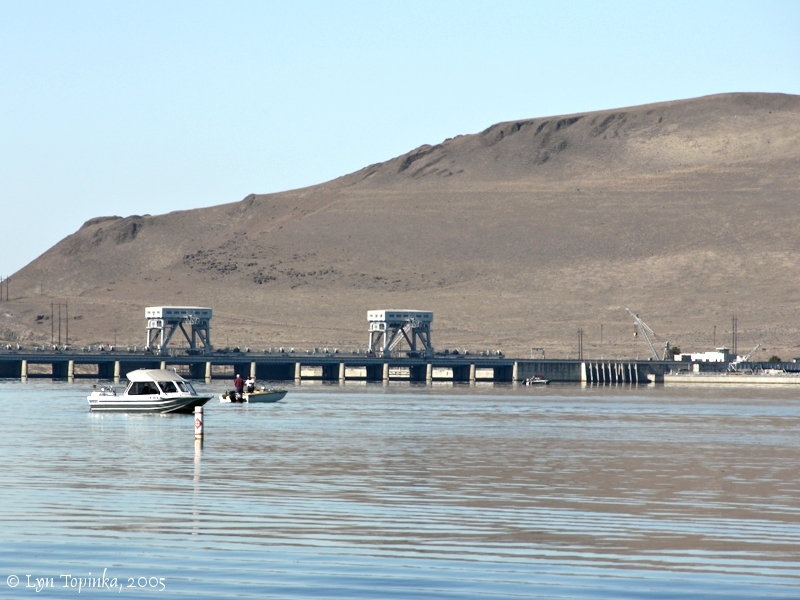 The dam is located at Columbia River Mile 292, and raises the normal water surface about 85 feet. 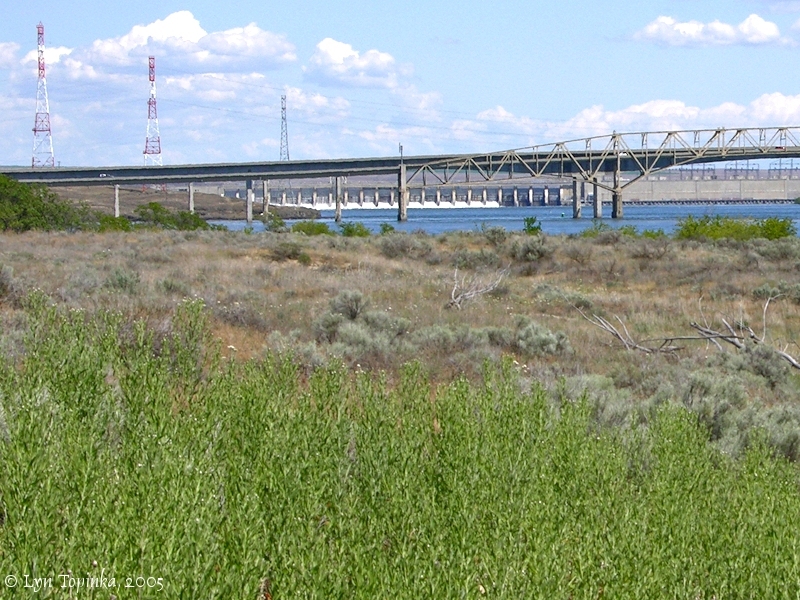 The project was originally called the Umatilla Dam, but the River and Harbor Act of 1945 renamed the dam in honor of the late Senator Charles L. McNary (U.S. Senator from Oregon, 1917-1944). 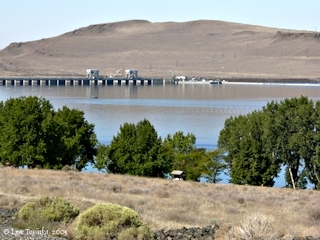 Click image to enlarge McNary Dam from McNary Beach, Oregon. Sillusi Butte is in the background. 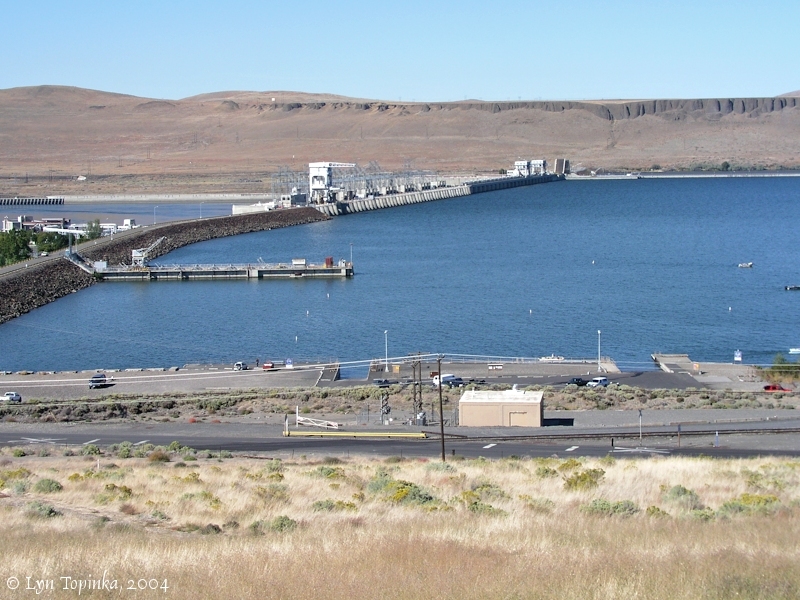 Lake Wallula extends 64 miles behind the McNary Dam. Image taken September 25, 2005. 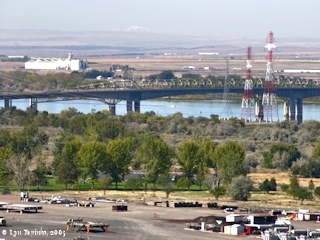 Click image to enlarge Interstate 82/395 Bridge with McNary Dam, from Plymouth Park, Plymouth, Washington. Image taken May 24, 2005. 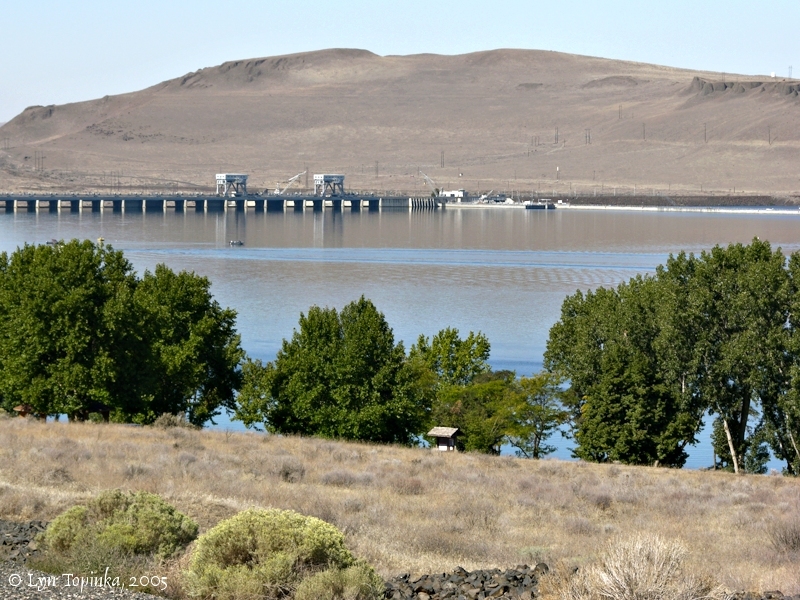 Lake Wallula lies directly behind McNary Lock and Dam. It extends 64 miles upstream to the U.S. Department of Energy’s Hanford Site (about 27 miles above Pasco, Washington), on the Columbia River. 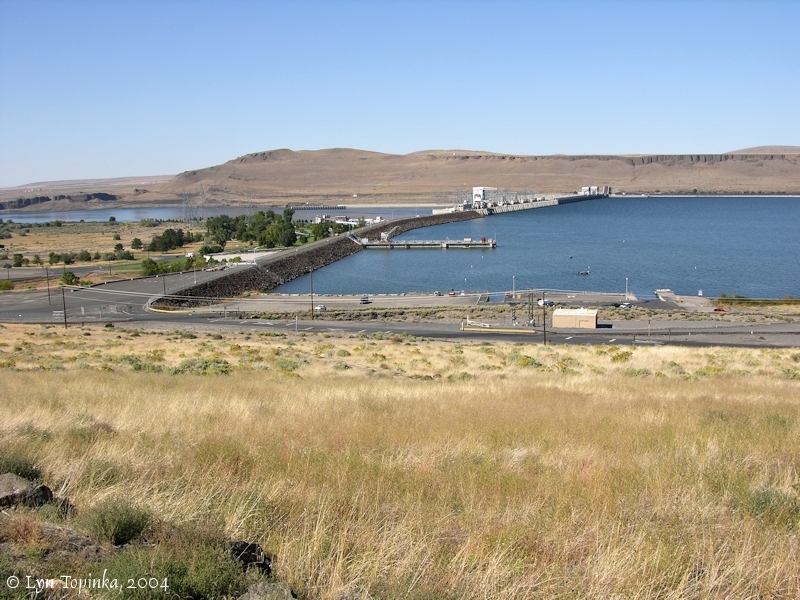 Click image to enlarge McNary Dam, McNary Beach, and Lake Wallula, Oregon. McNary Dam and Sillusi Butte are in the background. Image taken September 25, 2005. Click image to enlarge Lake Wallula from McNary Beach, Oregon. Image taken September 25, 2005. Lewis and Clark first see Mount Adams on October 19, 1805, while in the Umatilla region, although they mistakenly think it is Mount St. Helens. They also spot Mount Hood to the southwest. On a clear day Mount Adams can best be seen at Umatilla, Oregon, from two overlooks to the McNary Dam. Click image to enlarge Mount Adams from McNary Dam Overlook, Umatilla, Oregon. Mount Adams is very faint, just left of the middle of the horizon. Top of the peak sticks up above the haze layer. Image taken September 25, 2005. Sillusi Butte is located on the Washington State side of the Columbia River and overlooks McNary Dam. Lewis and Clark first passed through the Sillusi Butte area on October 19, 1805. Captain Clark commented on the "knob" across the river. 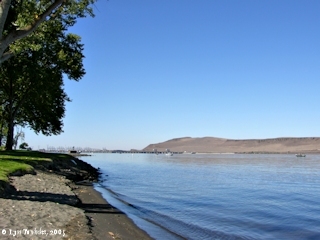 Click image to enlarge McNary Dam and Sillusi Butte, from McNary Beach, Oregon. Image taken September 25, 2005. Click image to enlarge McNary Dam and the location of the Umatilla Rapids. View from Dam overlook, Oregon, Highway 730, approximate location of the downstream end of the Umatilla Rapids, Lewis and Clark's "Muscle Shell Rapid". Image taken September 24, 2004. *River Miles [RM] are approximate, in statute miles, and were determined from USGS topo maps, obtained from NOAA nautical charts, or obtained from the U.S. Army Corps of Engineers website, 2003, 2004.